SONiK is campaigning against plans to create three hyper-acute stroke units for Kent and Medway, meaning the closure of services at remaining hospitals. SONiK says studies on hyper-acute units carried out by the NHS were based on London where no patient had to travel more than 30 minutes to reach a unit. They say the one hour plus journey time to Ashford from Thanet could put lives at risk. But in the statement issued today the Trust physicians and medical directors say: “The guiding principle of the clinicians who have led the Kent and Medway review of urgent stroke services is ‘First do no harm’. To state that doctors, nurses and therapists would develop and support plans that are a “dangerous experiment on the people of Kent” and will result in “less chance of surviving and…worse outcomes” is to call into question the dedication and expertise of those who want to do a better job for the patients they care for. “The simple truth of the matter is that, as they currently stand, our stroke services do not consistently meet best practice standards across Kent and Medway, and our stroke teams are not always able to provide the first class care they want to deliver. This is something that as healthcare professionals we have a duty to address. “There is a compelling body of national and international evidence to support the safety and benefits of our proposals for stroke services in Kent and Medway that we made public during the consultation earlier in the year and is available on our website. Any plans that compromised the safety of patients would not have been on the table, let alone the focus of public consultation. “There has been extensive correspondence with Save Our NHS in Kent about this evidence which, despite the fact that it has been developed and endorsed by senior and experienced experts in stroke medicine, they refuse to recognise. Save Our NHS in Kent have repeatedly been offered a meeting to discuss the proposals, an offer they have yet to accept. Dr Peter Maskell, Medical Director, Maidstone and Tunbridge Wells NHS Trust. Save Our NHS in Kent would like to respond to the statement by pointing out that ‘time is brain’; this is a maxim used by neurologists to refer to the rapid loss of brain cells when a stroke is left untreated. Every minute in which a large vessel ischemic stroke is untreated, the average patient loses 1.9 million neurons, 13.8 billion synapses, and 12 km (7 miles) of axonal fibers. Each hour in which treatment fails to occur, the brain loses as many neurons as it does in almost 3.6 years of normal aging. Thanet’s 141,000 residents will be one hour away from crucial stroke care once these plans are implemented, with possible ambulance response times of 40 minutes for some patients. We are confident that our concerns are justified. They say that their ‘guiding principle’ is ‘first do no harm’, and stress that the project is clinically led, but the fact is that the project in Kent is led by high-salaried managers with a business mindset, plus a few clinicians. The STP’s main duty is to drive through national reforms to scale back services so that far fewer hospitals in the country provide acute care (the treatment of sudden, urgent or emergency injury and illness that can lead to death or disability without rapid intervention). It is the Kent & Medway STP’s role to ensure that these plans are rolled out in Kent. This is no secret, it is revealed in the STP’s own reports. Sadly, the duty to ‘do no harm’ is contradicted by the legal duty of the commissioning groups to eradicate their large financial deficits. Were NHS funding more in line with 1948-2010 levels, these deficits would not be as crippling as they are. We stand by our assertion that it is an experiment on the people of Kent, as no other area in the country has such a high percentage of the population outside 45 mins journey time. We challenge the executives at the STP to disprove this. If they are unable to do so, it would be appropriate for them to retract the accusation that SONIK are behaving irresponsibly, halt the plans as they stand, and opt for a 4 HASU solution instead. All of the studies being used to back up the stroke review plans are flawed in some way or not applicable to this area. We are working currently on a document that summarises the numerous ways in which we believe the NHS managers are using data inappropriately, in particular the claim that death and disability outcomes will improve – we say there is no such evidence. They are also aware that studies exist that prove there are disbenefits to moving acute care further away, but they have consistently chosen not to mention that. They have also ignored their own impact assessment that was carried out independently in December 2017; it shows that negative consequences are likely. 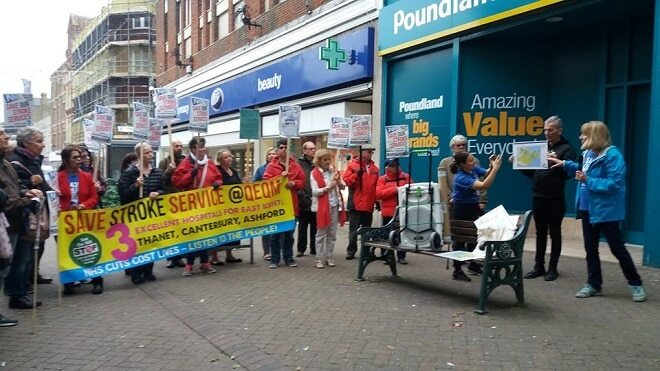 SONiK say they will continue to protest against the proposals and to fight for four HASUs in Kent and Medway, with one being at Margate’s QEQM. The next stage in the review process is to develop a decision-making business case – a detailed document that will describe how the preferred option was selected and set out an implementation plan that will cover areas such as workforce, estates and capital requirement. A Joint Committee of the ten local NHS clinical commissioning groups that ran the consultation will examine this and then make a final decision on the future shape of urgent stroke services in January 2019. It’s so good that the Trust wants to hear what SONIK has to say! How about a public meeting where all the burning questions can be answered rather than a “listening event” where no one listens to the people of Thanet? I don’t think anyone is contradicting what the specialists are saying about the alleged failings of stroke services in Kent,but they are not experts in logistics and so far they have been unable to answer how it will be possible to transport stroke patients from East Kent,especially Thanet, within one hour.Which they call the golden hour. The Wm Harvey hospital is not in East Kent it is in middle or West Kent. It is nearer Maidstone than it is Thanet. It is also badly laid out, poorly located for access from East Kent and fraught with all kinds of potential obstructions to achieving that 1 hr transit timing. I recommend that they think again and either locate the new stroke unit in Canterbury,Thanet or possibly a new centre in Whitfield. The population in East Kent is set to grow. NHS provision and the infrastructure needs to grow with it. They need to calm down,engage with their critics and listen; instead of assuming the usual top down,doctor knows best ploy. I’ve stated before that the first Golden Hour after a stroke is so important within which to start treatment; paramedics are well trained and experienced and have modern life-saving equipment on board the ambulances, but they cannot guarantee to blue-light a stroke patient to the William Harvey Hospital from Thanet within an hour during the rush hour, especially from the Reculver end of Thanet. With the large number of people being of an age into which the probability of stroke falls, it really does make sense to enhance the Stroke Unit we already have at the QEQM Hospital to meet the necessary higher standard, rather than trust to hope that patients from our area will make it to Ashford in time for successful treatment. Very true. And I would like to point out that ambulances cannot administer the life saving clot busting drugs that are needed for some stroke patients. Those drugs can only be given after a scan and the OK from a consultant; this cannot happen in an ambulance at the current time, nor is it a part of the plans. When the STP speak of a ‘body of national and international evidence’ then why are three only two studies listed in their documentary, London and Manchester, both of which involve ambulance times of less than 20 minutes to HASUs. Even then, the positive change in out comes is small, if not negligible. What’s more likely is less units can be run more effectively from a strictly financial perspective. The STPs evidence is extremely weak. Southend have just won a judicial revue for what’s happening to there services. This is about making the NHS exciting for private investors, not improving health outcomes. 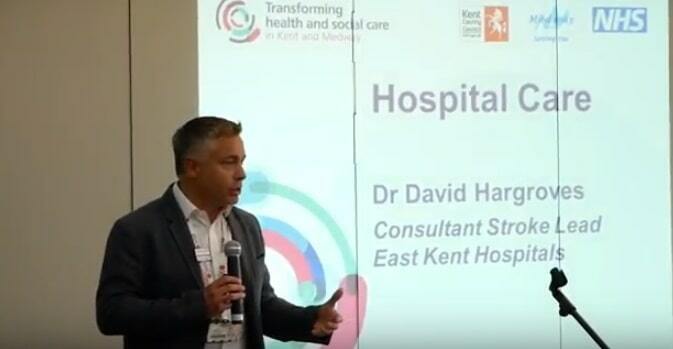 To totally abandon East Kent and to an extent Medway Towns to no Stroke services is abhorrent, why doe West kent need two hospitals offering acute Stroke services and Dartford who has London’s acute Stroke services on its doorstep. Dartford, Maidstone and Ashford are not exactly on the doorstep of Thanet residents and to say and hour plus journey by ambulance is a disgrace when the QEQM is here ready to take in patients within minutes. Its not just the patients of Thanet tha twill suffer, but also there relatives due to poor connections on public transport to Ashford, you only have to look at the bus service from Ramsgate to Ashord William Harvey hospital on a Sunday, 3 changes over an 8 hour period there and if your lucky back. It is family and friends who play a big aprt in the recovery of a patient from a stroke which seems to be missed by so called experts. Every death will be on their hands. Who will be willing to take this on to get a judicial review for the Thanet area to get the service it needs too? Our MP’s are so weak and are only bothering about things like Manston or Royal Yachts, they have their own personal agendas, they have no interest in the most important stuff which affects their constituents, the changes being pushed through in our NHS services. They are a waste of time. We need senior politicians to make a stand for the QEQM and stop what is going ahead despite their consultations telling them they are wrong and the people here disagree with them. Of course this is all Tory policy and cutting back on services to save money, we can’t expect out two Tory MP’s to go against these policies can we? People will not survive the trip to Ashford, it has been said a million times already but they just don’t care. They have money to waste on when they want to, but our really important health services are cut off, it’s just disgusting ! Come to the SONIK meeting to join the movement fighting to save our stroke unit at QEQM. Wednesday, October 17, 2018 at 6 PM – 7:30 PM, at The Red Hall, 11A Grosvenor Rd, Broadstairs CT10 2BT. I would personally like to stand by our statement in response and express my disappointment that professionals have chosen to misrepresent our standpoint and our concerns in this way. As this letter is effectively directed to us, and entirely about us, I find it interesting that it was released to several media outlets without ever notifying us of its existence. Generally the approach to take when trying to deal with disagreements is to approach those with whom you take issue; as we have done, on several occasions, have continually entered into dialogue, have continually asked questions, and have had to resort to public queries when questions either have not been answered or information is used either selectively or incorrectly. We have never, at any point, impugned the efforts or commitment of NHS staff. The absolute opposite in fact. We appreciate and acknowledge the extraordinary efforts that NHS staff are having to make now in order to maintain a level of service that they are happy with in an environment that provides ever more stressors and ever less funding. We acknowledge the extraordinary level of commitment of NHS staff and aim to support them on every level; that is clear in every interaction we have and everything we do. And that is exactly why we disagree with national guidelines being applied in an inflexible manner because it is frontline staff who will be bearing the brunt of this decision. It is nurses and doctors and consultants who will have to uproot their lives and move from one of the better stroke units in Kent. It is paramedics who will have to watch patients steadily losing brain function during that journey to Ashford. It is frontline care staff who will have to help those patients to recover from a stroke that time wise long exceeded national guidelines for treatment. This area requires different handling because we have different stressors, high vulnerability, poor transport, high deprivation, and attempting to bludgeon us into silence on this via the press is not going to work. Your own impact assessment contradicts what you say will be achieved; so you chose not to use it. The London and Manchester studies you say show increased disability outcomes don’t actually measure disability outcomes, and don’t include death before arrival. You are choosing to paint us as anti NHS, anti progress and ill informed when in fact we are well educated professionals and, more importantly, residents of this area. Attempting to shut down legitimate criticism by local residents is not an approach I feel you should be taking at this point. Instead of misrepresenting us and our approach, you could simply address our principal concerns. Stop implying that we’re completely rejecting the HASU model; we do have reservations because frankly more evidence is needed before a national roll out, but in reality, if this is the model that you’re choosing regardless, all we have actually done is simply pushed for a fourth in the area that stands to be worst affected under this arrangement. You have deliberately positioned us yet again as “resisting change”, rather than the reality, which is simply us pointing out that you can’t have sections of the country arriving at a HASU in under thirty minutes and other areas arriving after well over an hour and STILL insist on calling that equality of care. EVERY area deserves parity of care. EVERY area deserves excellence of care. Under this plan Thanet is not provided with it. I think all residents would greatly appreciate you putting the effort expended in trying to silence us and those who quite rightly see issues with the proposal into pushing for a quite clearly needed fourth unit. WH hospital is already struggling to fund care for patients within the Ashford area. Many Thanet households are already put under financial stress to fund journeys to see specialists in the WH in Ashford. Lack of stimulation from loved ones who can’t afford to visit will further compromise the recovery of Thanet residents who will suffer extensive disability due to extended journey times. Statistics from 2017 show that of the over 600 patients transferred to Ashford from Thanet, only 0.3 completed the journey time in less than an hour. People who voted for Tory Gale and McKinley will suffer disability or death due to the inaction of their elected representatives. I would like to echo the many lucid comments made above and respond to the allegations being levelled against Save Our NHS in Kent (SONiK) by four stroke doctors. As a researcher, I have spent the past few years analysing health policy for a parliamentary group. I have worked closely with SONiK to look at the evidence supposed to justify the creation of three hyper-acute stroke units at the expense of our current six units. In the case of Thanet, the evidence – that the benefits of a hyper-acute stroke unit would outweigh the disadvantage of having to travel for more than an hour to reach it – just doesn’t stack up. The people of Thanet, who suffer more strokes than in many other parts of the county, are rightly angry about the proposed loss of vital local services. I understand the pressures facing the health service, which have led to the deplorable situation that ‘our stroke services do not consistently meet best practice standards across Kent and Medway, and our stroke teams are not always able to provide the first class care they want to deliver’. The Government is failing to deliver a world-class health service, and it is putting the onus on health commissioners to cut services. Surely the answer is to put more resources into the NHS and to preserve services. Three of the doctors signing the letter are based at hospitals chosen as sites for the new stroke units. I would question their objectivity in this matter. Rather than vilifying those dedicated to preserving services for the people of Thanet, I suggest that all health professionals of good conscience join the fight for an NHS that works for everyone. Also – thanks to Kathy for printing SONIK’s statement in its entirety. Amazingly, some other media outlets decided to censor our response, which is difficult to justify at the best of times, but particularly unfair when a group is responding to an attack on their reputation. I would like to suggest that all of the people making the decision not to have a stroke unit at QEQM come here and then drive themselves to Ashford at various times of the day so they realise what a journey it is. They cannot make an informed decision sat in an office without experiencing the drive themselves.